Dr. Connolly is Director of Fisheries Ecosystems Advisory Services (FEAS) at the Marine Institute in Galway, Ireland. This broad and diverse group deals with fisheries data collection and management, stock assessment and advice, management plans, and stakeholder interactions. FEAS has a strong research component that is focused on the application of the ecosystem approach with strong links to Irish universities. 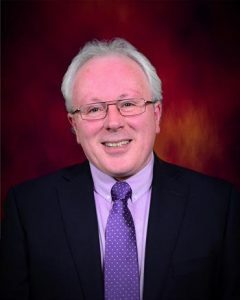 ​In October 2012, at the 100th statutory meeting of the Council, Paul Connolly (Ireland) was elected ICES President for a three-year term (November 2012–October 2015). Working with stakeholders has been a key area for FEAS and Paul chairs regular meetings with both the fishing industry and environmental NGOs. He chaired the EU Study Group on Research Needs (SGRN) from 2009 to 2011 that had oversight of the Data Collection Framework (DCF) and he is a strong advocate of a tight linkage between the DCF and the Marine Strategy Framework Directive (MSFD). A key aspect of FEAS work is the provision of advice to the Irish government on a broad range of issues including fish stock status and outtake advice, discard levels, measures to protect sensitive habitats, and indicators of good environmental status. “Working with the ICES community is critical to the provision of this advice”. Paul completed his PhD in fisheries ecology at University College Dublin (1986). He then worked in London in the taxation area. “I always wanted to live in London and working in the tax area taught me about dealing with people and the importance of reaching consensus”. Paul joined the Marine Institute in 1999 and began his long association with ICES. He worked on several stock assessment expert groups and co-chaired theme sessions at various ICES Annual Science Conferences. He was co-convener of the ICES Symposium on Fisheries Management Strategies in 2006. In 1999, Paul was appointed Director of FEAS and became Ireland’s delegate to ICES. In 2003, he was elected Vice President of ICES and served on its Board until 2005. In 2005, ICES appointed Paul as chair of a committee that conducted a root and branch reform of ICES and the way it delivers scientific advice on the oceans. These reforms focused on making the scientific advice more transparent to stakeholders, more integrated, and more in tune with the needs of clients. The reforms were adopted by ICES in 2008. He was elected First Vice President of ICES in 2006. In 2011, Paul chaired the Bureau Working Group that established the TORs and schedule for the international review of the ICES advisory services. Paul completed a Master of Business Administration degree (MBA) at National University of Ireland, Galway in 2006. “Looking under the bonnet (hood) to see how organizations work was a very useful skill I developed during this course and working with people who had a non-science perspective on life gave me new insights”. During 2011 and 2012, Paul worked closely with the Irish Government’s Marine Coordination Group (MCG) that developed an Integrated Marine Plan for Ireland (www.ouroceanwealth.ie – see Harnessing our Ocean Wealth). This was launched by the Irish Prime Minister in July 2012. “This is a very exciting time for ICES. Public awareness on the use of our oceans has increased and there will be a greater policy demand for impartial marine science and advice. There are great opportunities for ICES in the coming years”. “The ICES Strategic Plan 2014-2018 and its implementation plans offer a strong, competent, and open scientific community that can support the sustainable management of the seas”. “Our goal is to produce integrated advice that is based on innovative science and timely and accurate data while taking into account regional differences. Each regional sea area has unique challenges, and ICES possesses the expertise, experience, and creativity to address these”.